Kwazy Quilt is a two-dimensional packing puzzle consisting of 13 pieces that need to be placed within a frame. Imagine packing circles of the same size together as closely as possible. This gives you a hexagonal arrangement, where each circle is surrounded by six other circles, and with six small triangular holes between them. The pieces of this puzzle consist of a circle with one or more of those curved triangular shapes added. Every possible shape occurs once, except that the circle with one added triangle occurs twice. The frame into which the pieces are to be placed has an empty area consisting of a row of 5 circles with rows of 4 circles nestled into it on both sides, together with all the triangular areas adjacent to those circles. The pieces and the frame are shown below. The pieces come in four different colours. As an extra challenge, you can solve the puzzle such that no two pieces of the same colour are adjacent. 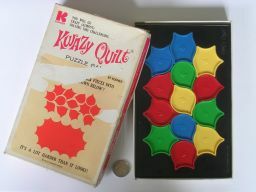 This puzzle was made by Kohner Brothers in 1960s and 1970s. Early versions have a frame made of cardboard, but later versions (like mine from 1972) have a plastic frame. The colour of the pieces differs between versions, though they do all use the same choice of identically coloured pieces. This puzzle game belongs to the combinatorial games, many of which became the subject of great interest and enthusiasm. Addressing the challenges posed by these games has been one of the branches of mathematics - combinatorics, which examines some of the operations over a certain number of items - letters, numbers, and geometric shapes. etc. The proposed puzzle is to pack the tiles in the frame box. But the figure shown is not the only way to place them. There are 1640 solutions. Apply your resourcefulness in searching them. Tiles may be laid down on either side. It contributes to the development of logical thinking, spatial imagination, ability to concentrate, and persistence in achieving your goal. Price 0 rub. 45 kop. 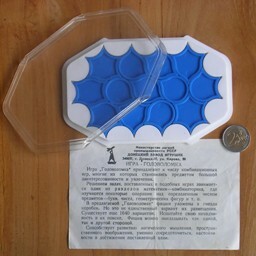 This puzzle has also been produced by Tenyo in Japan in their "Beat the Computer" series of puzzles. The pieces fill up the frame without any holes. From the shape of the frame it is then immediately clear that the pieces at either end of every row must be a shape with two adjacent triangular points. The two middle locations of an outer row each have one triangular point on the outside, but also have one triangle in between them that one of the pieces must fill. Therefore one of the two pieces in the middle two locations of an outer row also needs to have two adjacent triangular points. All together we need 8 such pieces, and there happen to be exactly 8 of them in the set. This all greatly restricts the number of possibilities. First fill in the leftmost location on each row. Consider the triangle location that lies on the top edge, between the first and second circle of the top row, and suppose that location is not filled by a point from the piece you placed at the left of the top row. It will then have to be filled by the piece you place next to it. That piece therefore has two adjacent points on it. We already know then that the third piece on the top row does not have adjacent points, so the second piece will also have to fill the triangle between it and the third piece. This means that the second piece will have (at least) three adjacent points in it. Separate the pieces into two sets - the 8 that have adjacent points (pieces 1, 2, 3, 4, 5, 6, 7, 9) and the 5 that do not (8, 10, 11, 12, 13). Fill the left and right edges of the board using 6 pieces of the set of 8. When doing this, also try to make sure that none of the six adjacent locations show two adjacent points that need to be filled. Place the remaining two pieces that have adjacent points. On goes in the top row, the other in the bottom row. Fill the rest of the frame with the remaining pieces. It is easiest to place piece 8 first, and leave 12 and 13 last. I have run a computer search to find all solutions. There are 96 solutions with the star shaped piece (piece 1) at the left end of the middle row (mirror images excluded), and 1701 with the star shape at the left end of the bottom row. Apart from rotations and mirror images of these 1797 arrangements, there are no other solutions. There are only two solutions in which no two pieces of the same colour are adjacent. These two solutions are shown below.